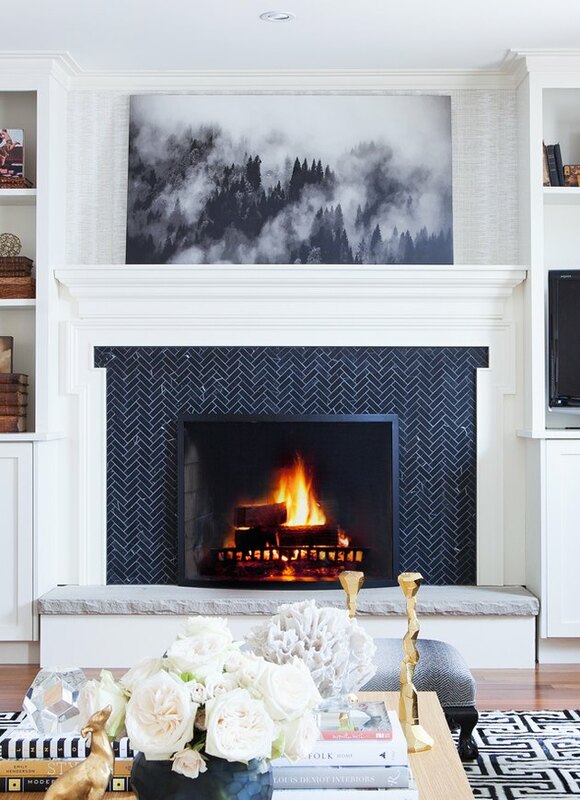 A fireplace instantly adds warmth, nostalgia, and ambiance to any room. When it comes to mantels — or surrounds, as they're commonly known — details matter. 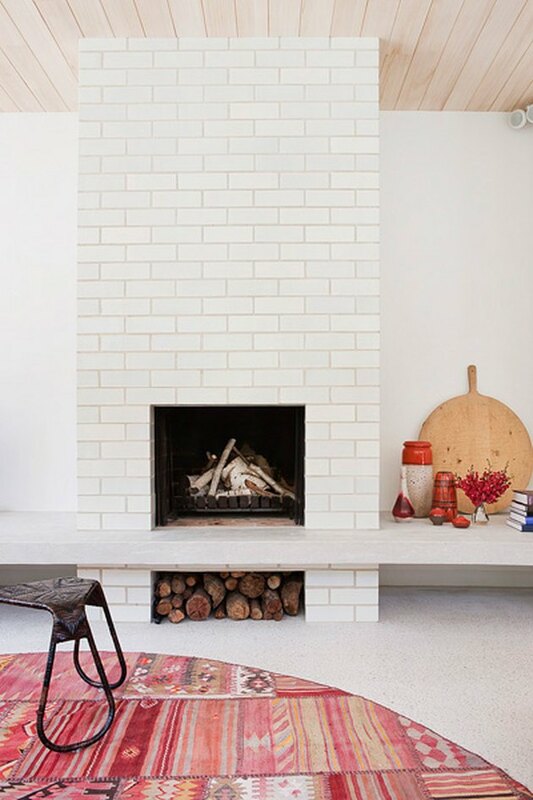 The right tile can turn a fireplace into a focal point. From shades of cobalt blue and crisp white to patterned tiles, ahead are 12 stylish surround ideas to inspire your home. Designed by Amber Lewis of Amber Interiors, this cool California home blends simplicity and boho flair. 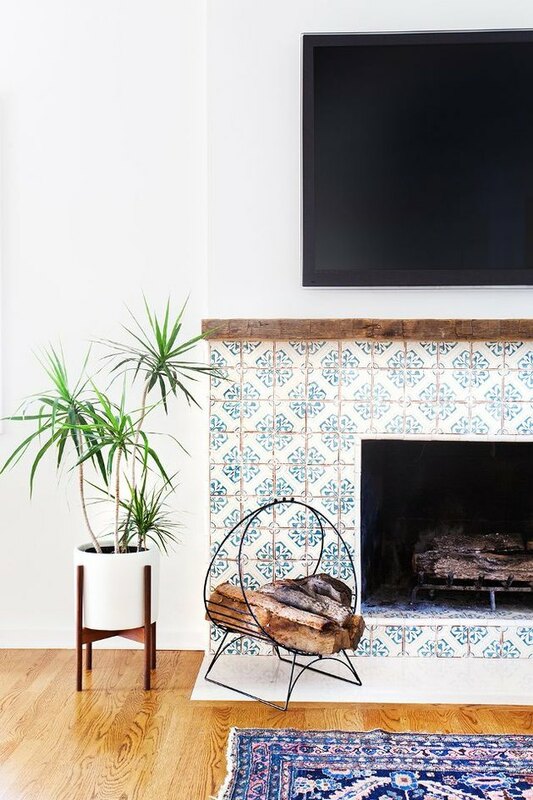 Encaustic cement tile, painted with a subtle floral pattern, infuses some color and complements the indigo rug. Crisp and contemporary, this living room is a prime example of how all-white doesn't have to feel sterile. 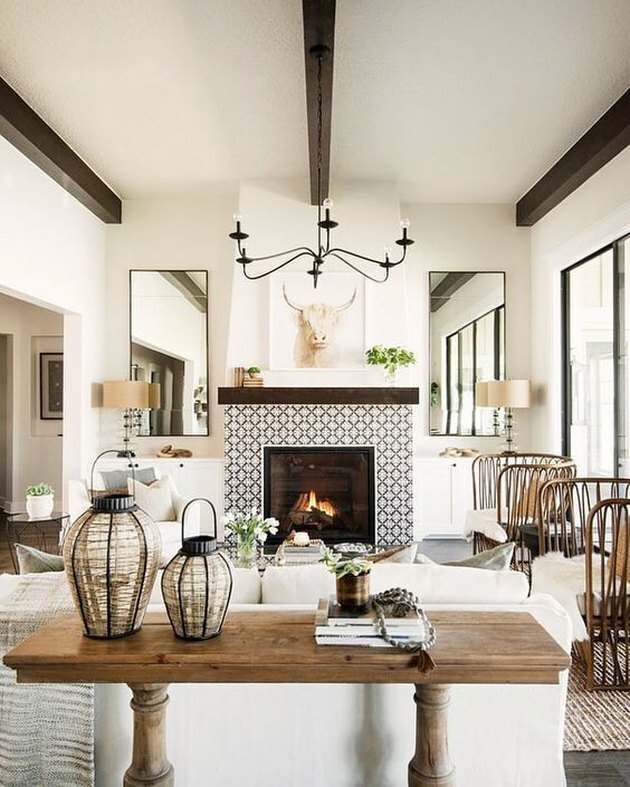 Boho accents — the warm wood ceiling, patterned circular area rug, unique stool, and a chopped wood logs — amp up the personality and laid-back appeal. 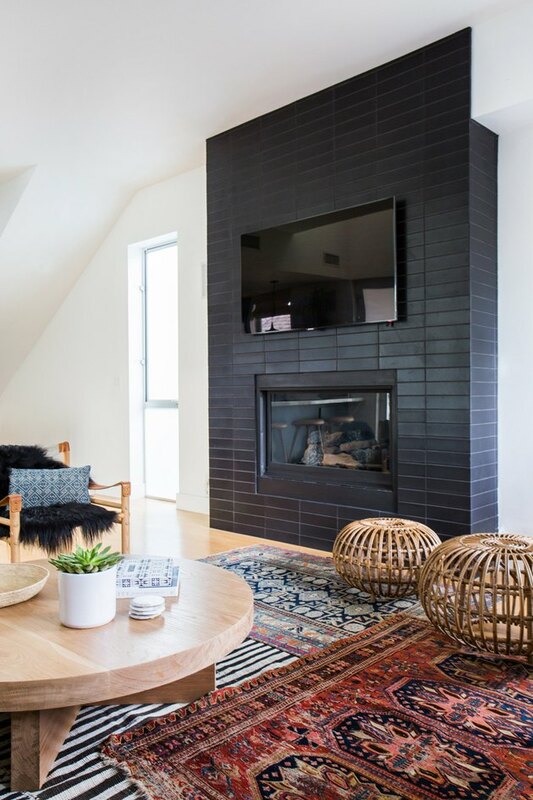 This gorgeous custom herringbone mosaic tile fireplace is flanked by built-in bookshelves that provide ample storage for tomes, treasured heirlooms, and wood logs to stoke the flames all winter long. Black and white done right! When Fall Out Boy's Joe Trohman moved to Los Angeles with his wife Marie Goble, they turned to Consort Design to decorate their Spanish home in the hills. This eye-catching black and white graphic tile matches the modern, edgy styling throughout the rest of their home. 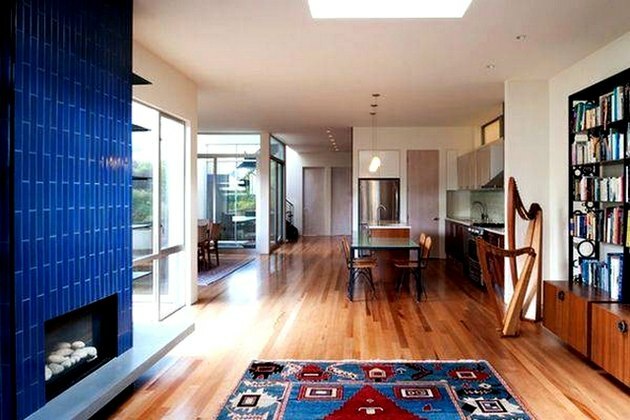 This open-concept living space in San Francisco strikes the balance between immaculate and inviting design. 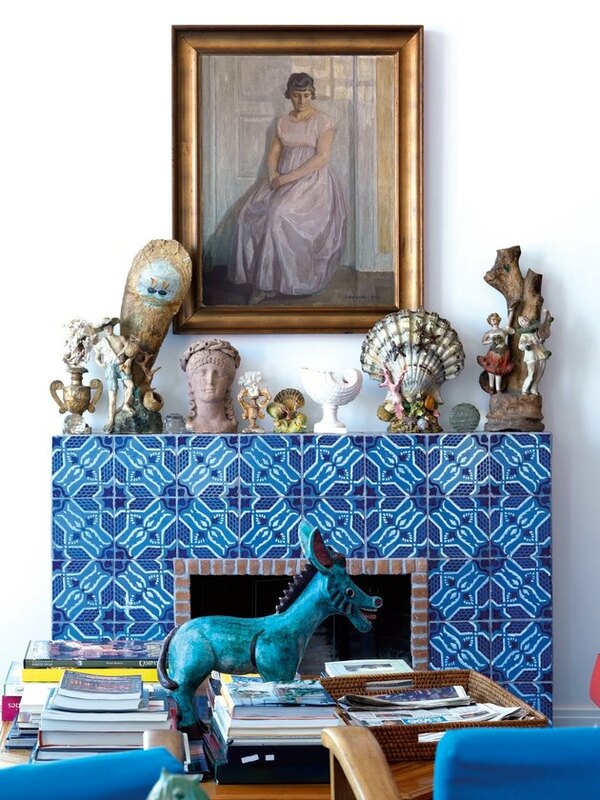 The cobalt tile-clad, double-sided fireplace demonstrates a flair for the dramatic. Wood floors, a Navajo-inspired rug, and recessed lighting add inviting warmth. Designed by Judith Balis, this lovely abode exudes country charm. With its soft hues, exposed wood beams, rustic print tile fireplace, and cozy seating, this living room radiates a pastoral yet refined sensibility. 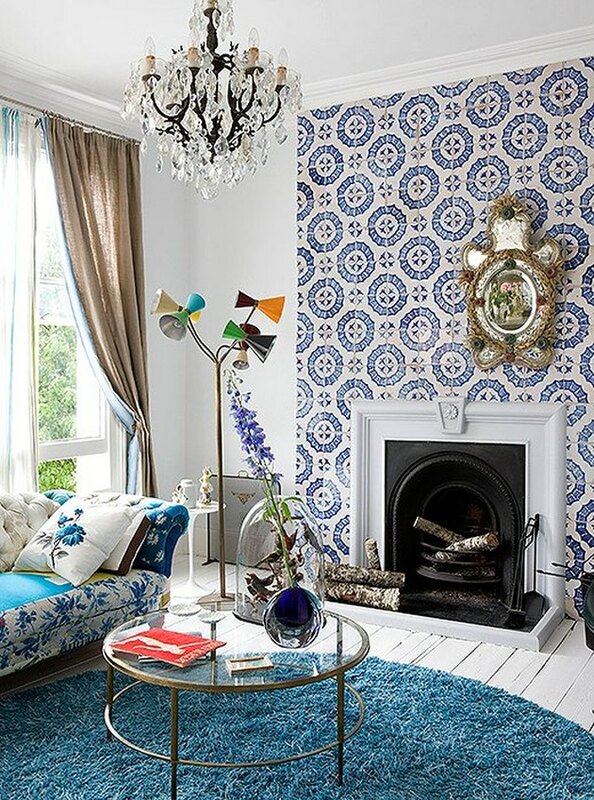 The eclectic London home of Designers Guild buyer Mark Homewood features a stunning antique Mediterranean tile-clad fireplace. The floor-to-ceiling accent wall paired with deep blue floral upholstery, luxurious drapery panels, a Parisian mirror, and a '60s era floor lamp exude a romantic allure that we just adore. 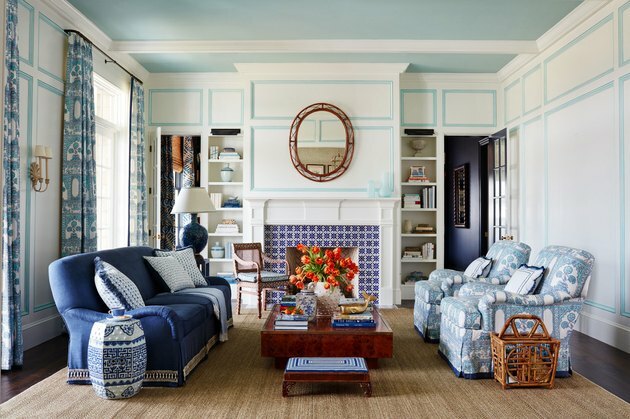 An exercise in sophisticated eclecticism, this sitting area designed by Andrew Howard, flaunts a vibrant cobalt blue hand-painted ceramic tile by Mosaic House. The beautiful fireplace surround tile, inspired by Moorish tradition, adds a rich sense of warmth, character, and tradition. 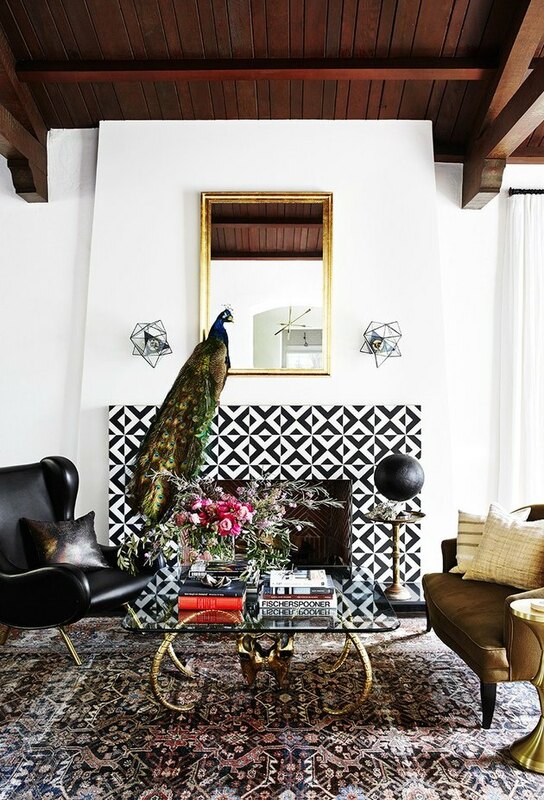 This Venice Walk Street abode, executed by Amber Interiors, marries modern and bohemian beautifully. The chic subway tile from Heath Ceramics contrasts handsomely with the stark white walls. The layered area rugs and exotic poufs echo the overall color scheme and pull it all together quite nicely. 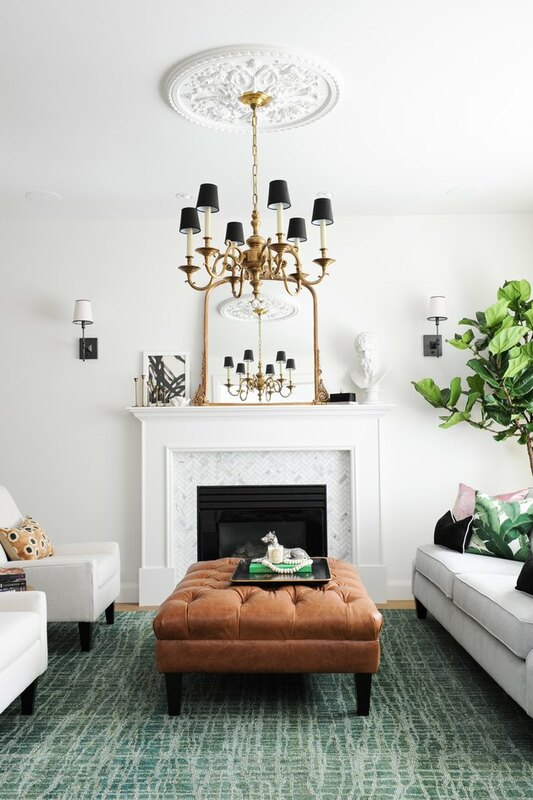 This elegant living room designed by Chrissy and Co. is proof that creativity comes with many rewards. The white marble herringbone mosaic tile, paired with dramatic floor-to-ceiling drapes, a tufted leather ottoman, ornate gold framed mirror, and a six-light candelabra chandelier, work together effortlessly to create an inspired interior. Exuberant hues and eclectic decor define the aesthetic of La Minervetta in Sorrento, Italy. And, perhaps, nowhere is that more evident than in this sitting room with its brightly-colored tile fireplace and assortment of eccentric accoutrements. 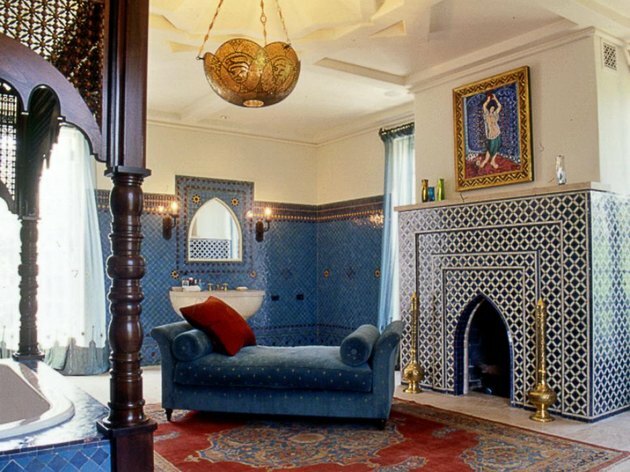 This Moroccan-inspired spa bathroom lounge, designed by Chris Barrett, seduces with jewel tones, ornate tile work — most notably the zellige-clad fireplace — gilded touches, local art, and an intricate canopy tub.